When you have a preschooler or two, EVERYTHING is home school!! I have noticed a lot of homeschooling is paying attention to what we already do and being a bit more intentional in the life we already lead. Today we needed to make more Chocolate Syrup (see Chocolate Syrup and New Family Food Plan). So I decided to engage the boys with me, as a small amount of science and cooking. I laid out all the ingredients, pre-measured, before we started and choose a bigger pot than the small pan I used last time. Let me just say, while I suspect there may be 2 year olds and 4 year olds out there in the big world who are ready to help cook. Mine, however, are not. They truly WANT t o and they seem interested, but impulse control is NOT where it needs to be. I always have this grand ideal of including the boys in cooking, or making things together. Of them learning math and science and also a real life skill in a cozy kitchen al of us together like Donna Reed and the Bospy Twins do Scott. This grand idea of the three of us peering over the edge of a pot and talking about different ingredients. Grand ideals. But it simple never works like that for us. We end up more like a bad Lucy Ball out-take. Big brother is doing much better, but it is just too much for Little Brother. He wants to grab it all, wants to be in the middle of it all and wants it NOW!!! I let Big Brother pour the water and the coca in to the pan, then I stirred it. 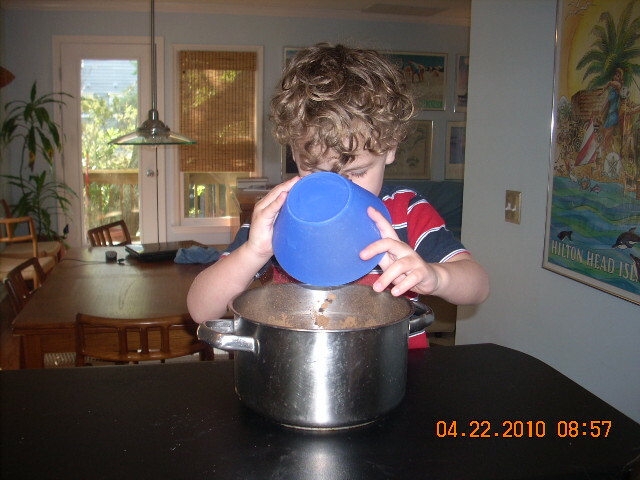 The boys are a ways from having stove privileges, a wise momma-sister has the standing rule you can not stir at t he stove till your elbow is over the stove top – we are adopting that. Then let him pour the sugar in, since the coca and water were not boiling and I was pretty sure there would be no splash. 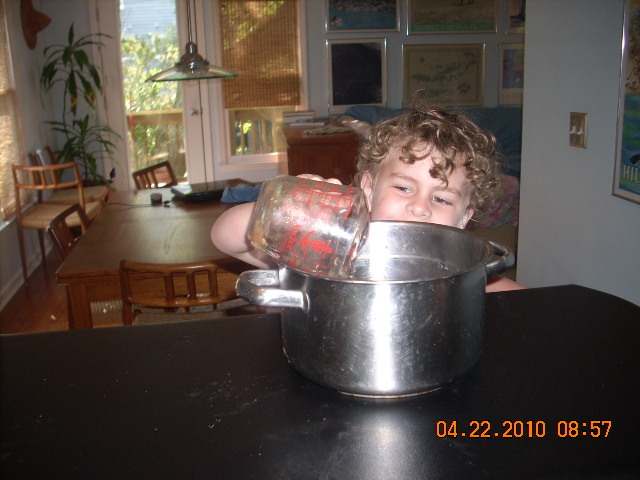 I let the boys watch till all the sugar dissolved – and discussed 2.5 cups into one cup of water – then sent them off. Big Brother was not as impressed with it as I was / am. I finished the stirring and boiling process alone. 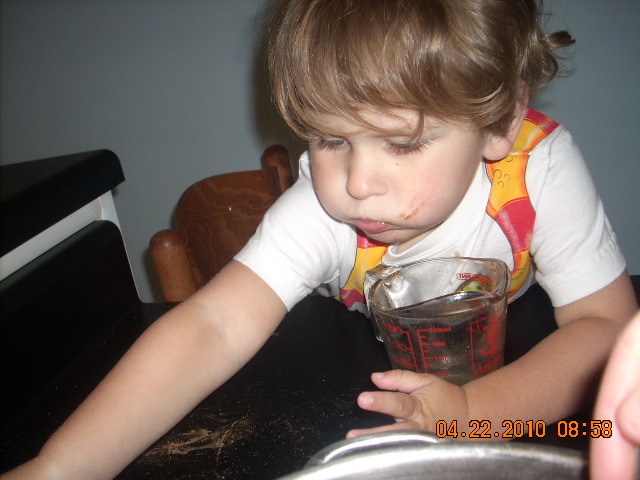 As part of the new Family Food Plan (FFP) — see yesterday’s blog — we had to give up our beloved chocolate syrup. This one was of the top 5 worries momma had. This change hit us hard, because “hot cocoa” first thing in the morning and last thing at night is a rite at our house. Also frequently, in the middle of the day, a good cup of hot cocoa will calm an upset Big Brother and help him settle like nothing else. Big brother fell in love with hot coca while visiting his Auntie Roo and watching Curious George together. George has hot coca in many episodes and the boys’ Auntie Roo was the first to make it for Big Brother (Little was too little at the time). So this is a special thing for both boys, especially Big Brother, and Momma did not want to have to have them give this up. However, one of the things we have had to give up, sadly, is Hersey’s chocolate syrup. Trust me it was a weekly purchase, so it is a big change for us, little though it seems. I don’t have any here in front of me to read the label and tell you WHY, but I know it had something. This was a hard hit. I knew it was going to be an issue and so before we started the FFP I did some research. The first full day of the new FFP I didn’t have a hot coca option. I made Big Brother warm milk and left him and Little Brother with daddy to go to the store in search of food past the boys’ bedtime. Shopping, as I am new at this, means reading every label and consulting my program book a lot. It is a long slow, somewhat frustrating, process best done alone. I came home to a wide awake, sad Big Brother asking for “hot cocoa please momma, please momma”. At the store I had gotten plain Hersey’s baking cocoa. Real cocoa. I made him some hot cocoa. Based on the recipe on the container, but the cocoa just didn’t really dissolve (the sugar did). 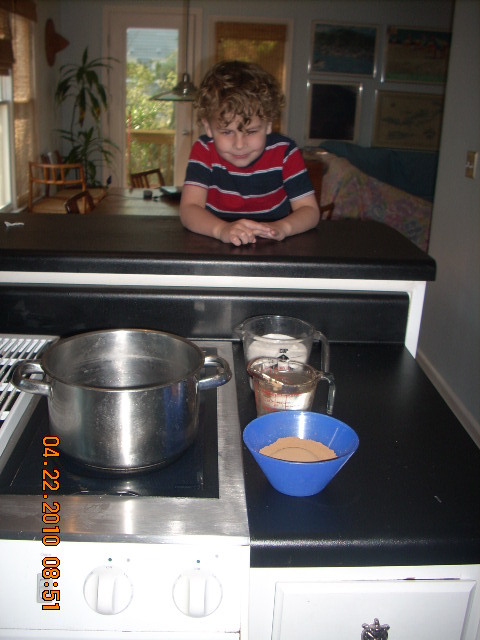 Also this was a pain, cocoa, sugar each time, he wanted a cup and it never really mixed well and seemed to always be all over the counter. Sometime he would drink it, and sometimes not. Can’t blame him, it was never quite right and Little Brother would not touch it. So Hubby suggested I make my own chocolate syrup so I didn’t have to make the hot cocoa from the 2 powders each time and also so we could make chocolate milk too (which while Little Brother won’t drink much of, is what he likes). Well anyone who knows me at all knows I was quaking in my boots at the idea of cooking something like that up all on my own (I hear you laughing PKRP you be nice). Off the cuff and cooking don’t go together for me, not yet anyway. This is an area I want to grow in and this will be a repeat them as the blog grows, but for now I am not even a novice. So I goggled the idea / process and for 3 options that all seemed reasonable. I chose one, for no other reason than it walked about using the home made chocolate syrup for chocolate milk with, of course, was my need. I had watchers who were very interested, and this vacation house has a bar behind the stove so they can come at me from the front as well as both sides. I am still not used to cooking that way so the first cooking session of chocolate syrup was a bit more stressful than necessary. Everything worked great until the 2nd to the last step. I was supposed to boil it THREE MINUTES. Well two problems, 1. Momma did not take into account how much “bigger” the mess would be boiling. The recipe warns not to let it boil over, now I know why – holy explosions batman, the one cup of liquid would “puff up” while boiling, it pretty much wanted to come right over the top of the pan instantly (gain I am sure some of you would expect that, not me, I had no clue). Need to use a bigger pan next time. And 2. the boys got really interested about the time it started to boil and about the time I was really worried it was going to boil over. So I had to try to run them off and block them with my body while trying not to have a HUGE STICKY HOT MESS on the stove. All the time with visions of how badly burnt one of us might get if this sticky boiling concoction got one us. So the end result, I did not boil it for the full THREE minutes before removing from heat and adding Vanilla (real). Even with the challenges, and how nervous I get the first time I make something – SUCCESS. Hubby came in the door just as I pulled it (too soon) off the stove. He said the house smelled great, so that is good. Hubby got first taste and said “just like the real stuff” LOL which made me laugh and a little sad too – we now think the packaged stuff at the store is “real” and what we do at home is a “copy”. What a commentary!! What would my Grandmother have thought, or my Great-Grandmother?? The syrup cooled to almost the same consistency as the store bought, a little “less think”. I am not sure if that is the not getting to boil for THREE MINUTES or is that is just the lack of “extras” in it. Makes great chocolate milk and hot cocoa!!!! And that is what matters. Maybe even ore importantly it also raised Momma’s confidence level that we can eat somewhat like we always have and still follow the new FFP. I made a 2nd batch. I got to let it boil the whole three mnutes this time — I don’t like it as well. It cooked down more, which I excpected BUT it cooked way down. The “boild 3 minutes batch” made only 1/2 what this batch above made. It also cooled almost too thick, almost like a failed fudge thick, well beyond syryp. So in the future (I see this as a 2 or 3 x a week thing, I will try bigger batches when we get home and I can get a dispenser for it) I will only boil for about a minutes. I suggest anyone trying this recipie for a surpy do the same, the “three minute batch” would make a good topping for cake or ice cream or something, but it doesn’t mix in to milk as well (hot or cold). We are two weeks into our new food plan, for Big Brother but for all of us too. This whole process started out as a shapeless knowledge we needed to be eating better, teaching the boys better eating. As a family we needed to start taking a hard look at our common diet and food choices and how “it” was effecting all of us and out health. We realized that all of us would benefit health wise from a better family diet and that we as parent are responsible for the eating habits and behaviors the boys will have the rest of their lives. We are very concerned about bad eating habits, too much junk, lack of good foods and (especially) the long term effects of eating habits learned now on the rest of their lives; this is a discussion Hubby and I have had several times. For a long time we were doing well (home made veggie baby food, delayed solids, and so on); but now that we stop and look at what we all commonly eat — uh ho. Personally we have decided two things. First that our whole family needs a diet “Clean up”. To get out the junk, extra sugar and to get IN more veggies and whole foods. Also that we need to try a fairly strict ‘food plan” with Big Brother to see if it changes any of his impulsive or emotional behaviors, and it the changes can show a benefit in his learning challenges. More and more research strongly shows that how the boys learn to eat, what they learn to choose, NOW will effect them for the rest of their lives and their long term health also. We have been doing some reading (one example: The N.D.D. Book: How Nutrition Deficit Disorder Affects Your Child’s Learning, Behavior, and Health, and What You Can Do About It–Without Drugs. The reading we’ve done has re-enforced what we have known about the importance of food choices and eating habits and also our parental duty to set them on the right path. We have started this food plan shift by talked with several families we know well and seeking advice about the best ideas. This is going to be a total over-haul and when we are done the family food plan (FFP) should bare little if any resemblance to what it looks like now. We will start by following the Feingold Diet which you may have heard of, it is not diet per-se as a new way of eating. The main site is: http://www.feingold.org. there is a lot of good information if you are interested in reading more about the links between diet and behaviors and learning challenges in children, and about the effects of many food additives on general health for all people 2, or 92. It is very interesting to me, the changes now from 30 years ago when I and all my close friends were young. I know that we were not, in general, exposed to all thing my boys are (pollution, food additives, vaccines) I feel there has to be, to some extent, a cumulative effect. Any one aspect of the boys’ life, I don’t feel, personally, is THAT dangerous – but when you add it all together that is, when I feel, the problems develop. It is impossible for any of us to avoid everything, so I feel the responsible and reasonable things is to avoid as much as one can so the unavoidable things are less damaging. In researching children’s eating and its effect on behavior and school abilities I have talked to several moms I know personally with children with different needs and challenges; some like Big Brother and some vastly different. I am blesses to have three awesome mentors as I re-vamp our family’s eating; a reconstruction this vast is pretty over-whelming, and I could no be wading in to this massive project with out such great guides and sister-mother’s. This blog: http://chickiepea.wordpress.com/about/ is the blog of a dear dear sister-mother and her AWSOME family and AMAZING 2 girls. She is walking the path I seek to follow boldly and with success. I trail after her in awww. We have discussed this as a family — because this IS a long term family change and the fact “we are just cleaning up our food choices as a family and getting the junk out”; as an over all life improvement for all of us. We have already been talking about GREEN LIGHT foods and RED LIGHT foods (thanks Dr Sears Eat Healthy, Feel Great (Sears Children Library)). The biggest goal we have is to establishing good eating habits in the boys that will last them a life time. As long ago as 1985, Pediatrics – the journal of the American Academy of Pediatrics – described the following side effects of Yellow #5: allergies, thyroid tumors, lymphomas (cancer), chromosomal damage, asthma, and urticaria (hives). The connection between this dye and asthma was the reason the Food and Drug Administration (FDA) first required it to be listed by name on ingredient labels. Those pretty colors that make the “fruit punch” red, the gelatin green and the oatmeal blue are made from petroleum (crude oil) which is also the source for gasoline. What are artificial flavorings? They are combinations of many chemicals, both natural and synthetic. An artificial flavoring may be composed of hundreds of separate chemicals, and there is no restriction on what a company can use to flavor food. You will find them on the ingredient labels, listed as “Yellow No. 5,” “Red 40,” “Blue #1,” etc. The label may say “FD&C” before the number. That means “Food, Drug & Cosmetics.” When you see a number listed as “D&C” in a product, such as “D&C Red #33” it means that this coloring is considered safe for medicine (drugs) and cosmetics, but not for food. Consider lead. That is a big subject, well covered by the Mayo Clinic’s website on lead poisoning, and the FDA tells us to avoid it because it damages the brain of both children and adults. Yet it is an interesting bit of trivia that while the synthetic food colorings are allowed to have no more than 10 ppm (parts per million) of lead, many of the “D&C” colors used in medications and given multiple times a day to sick people are allowed to have double that amount. I won’t put you to sleep with all my research (only most of it *wink*). This has been a long time coming, we’ve talked about it in general terms many times before now when we have finally decided it is time for rubber to meet the road. In the future you can look forward to new recipes in this blog, and also progress notes and observations, as well as more research I come across :). Ok, OK 🙂 I hear you: “what are you DOING” — enough theory, where is the practical? Simply put we are we are removing all artificial colors and flavors and preservatives. We will also be removing as much processed food as we can and seeking to eat “real food”. We will be reading a lot of labels, learning about new foods. Momma will be cooking more and learning to cook more. I am planning a unit on this for Big Brother for this fall. There is also a list on fruits that we are avoiding for now — apples, berries and a few others — because they naturally produce chemicals — salicylates — that have shown to effect behavior in children. (more about this below). Our intent here is to set a base line, then add back in all the “real foods” (apples, berries) that we can based on Big Brother’s behavior. While the other “removals” will be permanent. The biggest goal we have is to establishing good eating habits in the boys that will last them a life time and to make changes to the family “diet” for the better health of all of us. The idea that a better more healthy diet can help a child’s health, behavior and learning is well accepted at this point. See this trusted publication http://www.businessweek.com/magazine/co … _mz025.htm. Business Week “Eat Well Behave Better”. There are specifically a lot of publications addressing eating habits in children and behavior / performance in schools. Willow bark, which has long been used to ease pain and fever, contains salcylate which is the basis for aspirin. Some plants make salicylates to protect themselves from insects and disease. While salicylate-containing medicines such as aspirin can offer benefits, and plants that contain salicylates can be very nourishing, they are not well tolerated by everyone. My poor new pet, already neglected in the whirl of life. A fast update: Hubby has been working 5 am to 7 or 8 or even 9 pm each night, weekends included. We were blessed he was able to take Easter off. We are getting ready — me at home and him at his office — to travel for 4 to 6 weeks. !!! Hubby will be working in GA and the boys and are lucky enough to get to go along. 4 weeks on the coast of GA. I am doing back flips. We will go to the beach and we will go see the sea turtle hospital, and …. Be sure to follow along here I will try to post a few photos and to journal our activities. …thus the poor neglected blog. 🙂 I have books to add, and I hope to get a bunch of reading time while we are gone. Most importantly we will be taking time to allow our children to be children. This is my new mission, my new guiding principal. Stay tuned for more, a lot more, about this.